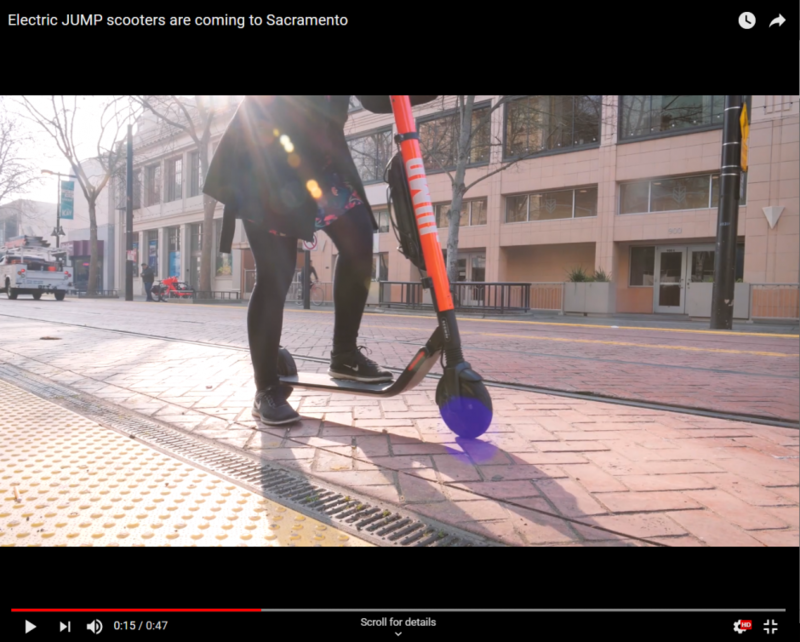 JUMP launched 100 electric scooters in Sacramento and West Sacramento in February. The scooters are free to unlock and $0.15 per minute after that and will be available in the existing JUMP service area through the Uber app. Uber purchased JUMP in 2018 to expand beyond cars as transportation options in their app. JUMP Bikes launched in Sacramento, West Sacramento and Davis in May 2018 and quickly expanded the service area and the bike fleet to 1,000 bikes. In downtown Sacramento, JUMP rides often outnumber Uber rides (Bloomberg) even. Jess Milbourn, owner of Devil May Care Ice Cream in West Sacramento, is excited with the new travel option. He rides them several times a week for commuting and errands and has already seen customers riding the scooters in addition to the bikes to his business. “As West Sacramento’s riverfront adds retail businesses in a cluster it’s critical to make sure that customers have travel options when parking is limited and the JUMP bikes and scooters are doing just that,” he said. To help introduce bike-share to the region SACOG helped lead a consortium of Sacramento, West Sacramento, Davis, Regional Transit, Sacramento Metropolitan Air Quality Management District, Sac State, and UC Davis to negotiate together with JUMP to provide a baseline service agreement. That early cooperation has provided a mutually beneficial environment that allows JUMP to operate with some certainty in their city partners and that gives the cities reassurance that the service is being provided in an equitable and safe manner. Although scooters in other cities have been popular with users, they have introduced new safety and right of way concerns, which have led to cities crafting new regulations. The City of Sacramento has an existing ordinance that regulates scooter and bike share companies and is currently developing a revised regulatory framework for shared rideables. West Sacramento is currently developing a Micro-Mobility Regulatory Framework. Both ordinances are anticipated to be reviewed at their respective City Councils in March. Davis also adopted a bike share ordinance in 2018. Step 2 – Ride: Simply scan the QR code on the scooter to unlock. Put on a helmet and go. Step 3 – Park: Park scooters on the sidewalk keeping them out of the way of pedestrians and other vehicles.